At this year’s Esri Developer Summit in Palm Springs, you shared some great stories about how you’re using the new Append functionality to update data in your hosted feature layers. You also requested some enhancements. 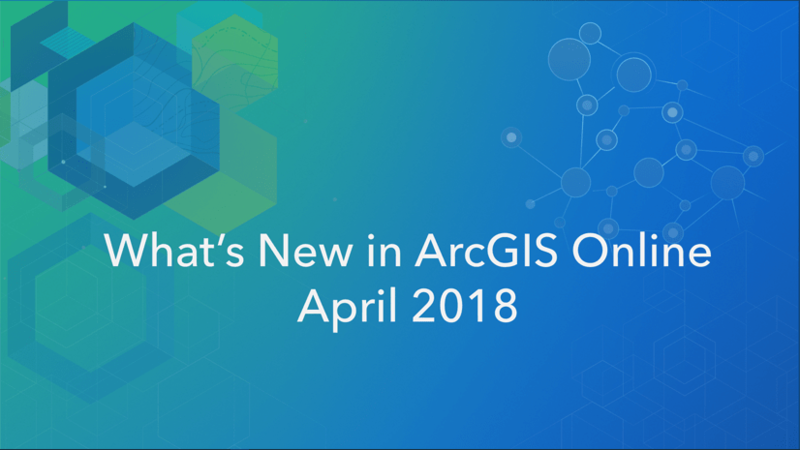 The good news is that some of those enhancements were already in the works, and with the latest update of ArcGIS Online, you can start to take advantage of them. Data updates can come from just about anywhere—especially if you’re working with multiple contractors and organizations, each with their own internal business processes and standards. ArcGIS Online now supports appending data in two new file formats: Excel and GeoJSON. If you or someone you work with makes use of Excel sheets, you can now skip a step and not export it out as a CSV file first. Excel files do not have a strict field type, so to avoid unexpected results it is recommended that the first few rows of your data accurately reflect the field type for the data, otherwise information could be dropped during append. Additionally, those who favor more open formats can now append data in GeoJSON files. These two formats give you a few more options like you have in other areas of ArcGIS Online such as publishing new layers. Many of you have your own ID fields that are unique and reflect the naming standards within your organization—for example, an Electoral District, Parcel ID, Asset ID, or anything that uniquely identifies the feature . Now you can use that field as the match field when updating existing data. 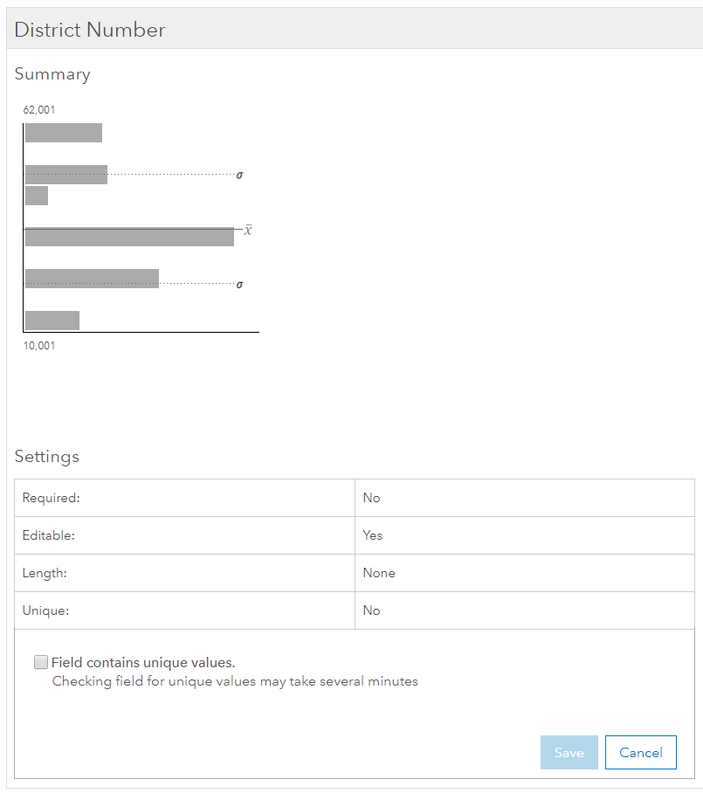 To take advantage of this feature, you first need to enable the setting on the field to verify that the existing data for that field in the layer is unique. To enable this start from the layer’s item page, go to the Data tab, click on the field you want to use as a unique ID, and choose Show Field Details View. Under Settings, you’ll see an option to set the field as unique. Depending on the size of your data, it may take some time to validate that the existing data is unique. If the validation fails, take a moment to review the field to make sure there are no duplicate values. Once the field passes validation, it will be available to use as the match field anytime you choose to update existing features. This option should make it easier to integrate data updates coming from external databases where it can be difficult to maintain ObjectID or GlobalID fields from your GIS. Working with feature layers offline requires that sync be enabled on the layer. Until recently, it wasn’t possible to append data on sync-enabled layers. We’ve relaxed that restriction in this release, and now you can add new features to your layer through the Append workflow. Updating existing features for sync-enabled layers is still a restriction, but one we hope to remove in a future release. With this release, it’s also easier to only update the attributes for your existing features. If the data you upload contains more features than what matches to your feature layer, you can choose Skip features without a match so that any data in the uploaded file that doesn’t match to a feature in the layer is ignored. If you happen to upload data that has a different geometry type than the feature layer, rather than preventing you from going further, the Append workflow will now let you do an attribute-only update to existing features. If you look at all these enhancements, you’ll see a common theme: flexibility. Managing data is a challenging task and being forced into a specific file format or workflow really limits what you can do. Updating data is about giving you a flexible set of data management options to fold into your workflow to facilitate updating data. Speaking of flexibility, stay tuned for the next blog showing how you can use the python api to get more work done with append. We’ve loved hearing how you’re using append to improve workflows—we can’t wait to find out what you do next. Product Engineer for ArcGIS Online and technology enthusiast.